If, come summer, you will be nursing a beautiful baby bump rounder than a beach ball, now is the time to start thinking about how to stay cool, comfortable and relaxed as the temperatures soar. Planning a wardrobe of trendy and comfortable maternity clothing will help make the heat a little more bearable. Clothes for pregnant women should not just be easy to wear and unrestricted, but they should also be comfortable, trendy and made from natural materials that help keep your body temperature stable and your maternity outfits should be versatile and stretchable enough to accommodate your growing baby bump. But who, these days, can afford a huge maternity wardrobe? If you are budgeting for baby then it makes sense to invest in maternity clothing that can be worn throughout all three trimesters. Choose clothes that can be used for all three trimesters with a loose fit and breathable fabrics to see you through the summer. 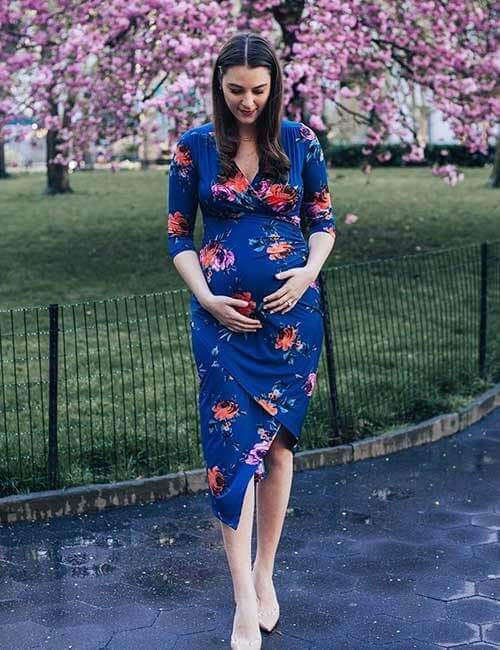 A popular choice of maternity outfit is a knee-length dress and low heels because a round tummy is likely to look less comfortable and trendy in miniskirts. So, while choosing your maternity outfits, pay attention to the styles that will flatter your body, even with a big baby bump. Below are some maternity fashion outfits that are worth buying during this most precious time. Before you start spending, make sure you sign-up to a reliable fashion portal so that you get to choose from a huge collection and that too at reasonable rates. Mothercare is the leading shopping store online for maternity dresses and any other stuff. You will find a wide variety of trendy affordable maternity clothes at pocket-friendly rates. Not only this, the shopping site enables you to enjoy maximum discounts and savings with its exclusive codes and voucher. You can check out all the latest Mothercare discount codes on CollectOffers UK. Now, coming back to the trends, I have compiled a list of trendiest fashion staples for pregnant women. Scroll down! Whether you are dressing to ready for a party or for a relaxed family meal, a strapless maxi dress is an ethereal, stylish, effortless and comfortable dress for a mama-to-be. The dress will elegantly flatter your body while letting you flaunt your baby bump. Do you shy away from wearing skirts or anything well-fitted? This outfit idea is a super-cute maternity style that might just change your perception. A pencil skirt when teamed up with a super stylish and trendy top like funky turtleneck top, can take your look to the next level. Although the outfit is already comfortable, you can add even more comfort and flexibility to your look by wearing casual shoes and funky accessories. If you have to work in the initial days of your pregnancy, but you worry about what to wear that will flatter your body without drawing too much attention to your baby bump, then asymmetrical dresses and tops are the answer. Asymmetrical dresses and tops are perfect work wear for those early days as they will hide your growing baby bump under the flowy and flared fabric. For those women who love to flaunt their blossoming figure, bodycon dresses are simply the best choice. Bodycon dresses are hugely popular at the moment and are available in myriads of styles and patterns. An off-the-shoulder bodycon maternity dress is a perfect outfit for an expectant mum who is as likely to dress for a casual night out as she is for a party or dinner. Still one of the trendiest fashion staples, t-shirt dresses are the most versatile piece of clothing for pregnant women. They can be worn at Sunday brunch, as a nightdress and even for casual outings. T-shirt dresses are the coolest and most comfortable maternity dress as they are often made of sweat-absorbent fabric that will help you stay dry and fresh all day long. So, these are five must-have maternity fashion staples that are versatile enough to be worn at any trimester of pregnancy. To enjoy maximum savings and discounts on maternity clothes from Mothercare, make sure you check out the Mothercare discount code. Where do you shop for trendy affordable maternity clothes? "Get Your Kids Out In The Garden – And Grow"
"Buying Your First Horse? Don’t Fall At The First Hurdle."